Logic Pro | What Could Current Food Trends Have To Do With Creative Choices in Audio Productions? What Could Current Food Trends Have To Do With Creative Choices in Audio Productions? I love food analogies and use them perhaps a bit too often. Limiting them to say 3 times a day like the meals themselves, would I guess be a good idea, but please bear with me. I think it will be a fun and effective way to shine some light or at least, change the perspective of the light we see on how we record and mix today. In particular, there are 2 food trends we see a lot of today, both in the restaurant scene and in home cooking media, that I feel worthy of some discussion. We’ll then look at how this may be in an analogous manner, affecting our choices when it comes to music production. The first trend is taking a traditional dish, typically a staple of “la cucina povera”, the working class cuisine and making it using the latest, greatest, coolest, chic, most expensive ingredients. I am not referring to adding an exotic ingredient to a staple dish never done that way before like Lobster Mac n’Cheese or Foie Gras Shepherd’s Pie, that’s another discussion for another day. Instead, as examples, let’s look at 2 dishes I think everyone can relate to; French Toast and (not at the same sitting please) Crab Cakes. Google either and you’ll see lots of links to super chefs and how they source the finest ingredients to craft a superior version of either dish. In the case of French Toast, one often will see references to the freshest breads with this or that super grains, hand-milled artisanal flour, free range eggs etc. Same deal with the crab cakes, the finest jumbo lump crab meat flown in daily by private jet from an exclusive hidden landing strip somewhere near Juneau, AK . The fact of the matter is that both those recipes exist to find a tasty way to salvage less than prime ingredients instead of throwing them away. The crab cake exists to use all the tiny pieces that are left over once the best parts are spoken for. 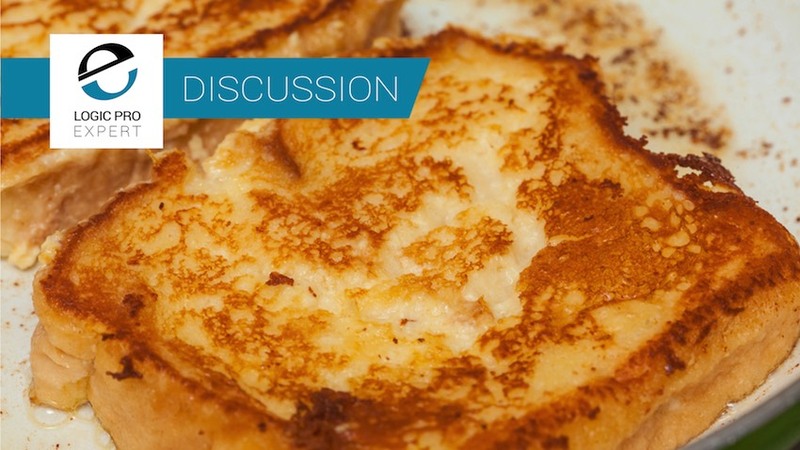 French Toast in the French language is “Le Pain Perdue”… the literal translation being the lost bread. French Toast exists to use bread that was still fine to eat but well past its prime for freshness. Let’s now take this idea to our Logic Pro X sessions. Do we always want to use the ultimate signal path for each and every track? Will they all live happily together when mixed together? Taken to an extreme, and I know people who work this way, applying a mastering level process to each and every track prior to mixing. I would instead suggest we need to make it a point of letting some tracks live in their intended space with their inherent flaws, limited bandwith, natural noises and artifacts. Some companies address this and offer a clean and dirty version of their process. As examples, Acousticsamples electric pianos and Brainworx console emulations come default with settings where certain channels or notes have slight imperfections as one would find with any 25+ year old piece of gear as a feature. We also see some great recreations of vintage reverbs and delays with bit degradation, wow, noise and other artifacts carefully included. This is a great thing and shouldn’t just be used for nostalgia. Certain tracks need to sit in a space that matches their context and often super hi-fi full range processing isn’t the best choice. It is simple and feel good tracking and mixing, just like French Toast or (but not and) Crab Cakes. Next food trend I wish to discuss is the idea that we take the featured food, typically reduce it to its purest form i.e. trim off all fat, skin, cartilage, bones, etc. Then we cook it in a manner that all the drippings fall away, supposedly saving our arteries often at the expense of our palettes. Finally, we then introduce some form of topping, sauce, or gravy in order to enhance and often mask the remaining flavour if any. I have a friend and his rule of BBQ is if the restaurant advertises its famous sauce(s), rather than say, famous meat, one should immediately go elsewhere. We won’t even discuss what may be in said accompaniments but at a typical chain restaurant, that yummy sounding lemon saffron aioli is more than likely some whipped palm oil because well real eggs are perishable and of course lemon is cheaper than saffron…and in the end, the gain on the health scale is quickly offset once the final presentation is considered. In contrast, foods cooked in their own juices such as braised meats, stews and other dishes from our grandmother’s cookbook retain their nutrients and do not require extra flavourings prior to serving. So by now, most of you know where I’m going with this. Simply put, there is a tremendous benefit to looking at one’s workflow and recording tactics with regard to how much information we trim or let drip off only to then spend time and money trying to add back some vitality or dimension using plug-ins and production tricks. Letting tracks keep their spatial and frequency spectrum can ultimately make the mix actually easier as long as we apply the basic foundations of recording techniques and record good performances properly. In particular, I would draw attention to avoiding certain so called “audio rules” some of us getting coerced into adopting without even first checking the audio that will be affected. For example, blindly hi pass filtering all “non-bass” tracks or strip silencing a vocal track. On the other hand, I am not necessarily advocating always leaving everything always as is, although certain mixers and producers have made careers from doing exactly that. Taking all this into the real world, there are hundreds of examples where engineers of the greatest recordings encountered tremendous limitations of the technology of the day and yet they were able to create works of art that have stood the test of time and appealed across generations. Often the limitation was turned into a feature and in some cases, became a standard for the production of the genre. Today, with endless track counts, precision editing tools and AI processes (yes folks, we are now “there”, this will certainly be a future article as well, pardon the pun), it is easy to lose the very essence of the music we create. By taking a fun look at these foodie trends and taking a bit of perspective back to our creative space, we can use this discussion to improving the ultimate quality of our decisions in the studio.